Multiple fatalities have been confirmed in a shooting at the Fort Lauderdale-Hollywood International Airport in Florida. The suspected attacker, 26-year-old US military veteran Esteban Santiago was taken into FBI custody. “Multiple people” were dead, Broward County Sheriff’s Office told the media. At least five deaths were confirmed. Eight people were injured and transported to an area hospital, the sheriff's office said. Two underwent surgery and all are in stable condition, Broward Health representatives said in a late afternoon press conference. He confirmed that there was no second shooting despite previous reports. The suspect was being interrogated by the FBI. "We have not ruled out terrorism," an FBI official told reporters in a late Friday evening press conference. The official also stated Santiago would likely appear in federal court to formally face charges on Monday. The shooter reportedly traveled with his gun legally, checking it with other luggage. Upon picking up his bags, however, he then took his gun and ammunition into a restroom before returning to baggage claim and opening fire, according to Broward County Commissioner Chip LaMarca. "The shooter was a passenger on a Canadian flight with a checked gun," LaMarca wrote on his Facebook page. "He claimed his bag and took the gun from baggage and went into the bathroom to load it. Came out shooting people in baggage claim. There were 13 total shot, 5 dead, 8 transported to hospital." Senator Bill Nelson (D-Florida) confirmed that the gunman carried a military ID for Esteban Santiago, a 26-year-old Army National Guard soldier. Reuters reported that Santiago had checked a 9mm pistol and arrived in Florida on a Canadian flight from Alaska, via Minneapolis. A photo of the alleged attacker has been posted on social media, but has not been verified by the authorities. Esteban Santiago was discharged six months ago and had deployed to Iraq. CBS News reports that in November 2016, the shooting suspect walked into an FBI office in Anchorage, Alaska, to report being forced to fight for ISIS. Florida Governor Rick Scott traveled to Fort Lauderdale to oversee the government response. In a press conference around 5:15pm Eastern, Florida Governor Rick Scott (R) said that he reached out to President-elect Donald Trump and Vice President-elect Mike Pence "quite a few times," citing a personal relationship. He said "this is not a time to be political" after acknowledging to reporters that he did not reach out to President Barack Obama. The governor also highlighted the ease of cooperation between state and federal officials responding to and investigating the shooting. Broward County authorities said the shooting began outside the terminal and continued inside at the baggage claim. Photos from the scene show at least two victims outside the building. A graphic video from inside the terminal shows bloodied victims in the baggage claim area. 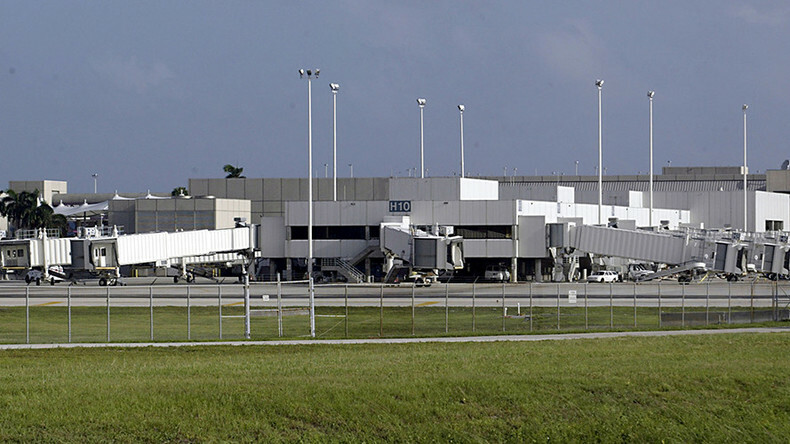 All services were suspended at all terminals of the Fort Lauderdale-Hollywood International Airport. The FBI is assisting with the investigation, Special Agent in Charge George Piro told reporters. If the motive points to terrorism, the sheriff’s department will turn the investigation over to the FBI, Israel said. The FLL airport authorities confirmed the incident took place in Terminal 2, but did not offer any further details. Terminal 2 is served by Delta Airlines and Air Canada. FLL handles 80-100,000 passengers on a typical day, director Mark Gale told reporters. Airport authorities are working with the police to clear the terminals and release everyone both inside the buildings and still on the tarmac. At 2:26pm Eastern time, more shots were reported at the parking garage in Terminal 1, and there was police activity in other terminals previously unaffected by the shooting at Terminal 2. Mayor Sharief told MSNBC there was no second shooter, however, and that police were searching the airport out of abundance of caution. Passengers inside the terminals were instructed to continue sheltering in place.